Presented here for your consideration, we have our staff’s picks of their favorite unlicensed third party transforming robots of 2018. 2018 has brought an interesting crop of high-end high detail figures and solid smaller releases in the Universe aesthetic as well as more smaller, Legends scaled figures. Our crew have picked their favorite releases from the year that was – read on to check out what we liked from 2018. With tons of 3P releases this year, it’s great to see some more alternatives to only G1 Masterpiece characters. I have always thought 3P companies should look for more alternatives to offer to the fans. I was quiet impressed to see Unique Toys take on AOE/TLK Optimus Prime. The humanoid/knight robot mode to truck mode work almost as magic, with fairly movie accuracy in both modes. This is another of those toys who shows off “mass shifting” while transforming it. Top finishing, great poseabilty and available for fans who know an official release is not coming soon, or maybe, it won’t be better than this rendition of Optimus Prime. This year for me is a recurring pattern of shying away from buying many third party products because of price, so my choice were very selective. Of the few that I actually got, I think this little guy takes to top spot for me because it is bringing a rather unique design that has not been done before into life as a full fledged transforming figure. While not the best articulated or the most engineered figure out there, the transformation is easy and fun, and it represents the Heart of Steel design fairly faithfully in both mode at a very affordable price point. I don’t do much by the way of third-party anymore, but this set was an absolute must to give the first of the dynamic duocons his appropriate G1 weapons. The new blade is nice and fits in Battleclash’s hands, unlike the stock piece. The new additional blaster for Roadtrap is also a well done piece, but ultimately adding the entire kit to the combined mode of Battletrap is the real star here. Goin with another reissue, even though I got him at the beginning of this long and arduous year, Fans Toys’s take on Galvatron is one of the most imposing third party toys I own, matched only by their Omega Supreme and beaten by their Grimlock. Sovereign is the cartoon model ripped right from the screen, he’s solid as a rock filled with diecast, captures the psychotic Decepticon warlord in every way possible. The cannon effect piece is a nice touch as well, and if it wasn’t literally made for Primes only, one would think the Matrix around his neck was made for him alone. With this beast of a figure on my shelf, it’s honestly a mystery how I managed to avoid getting their recently-released Cyclonus and someone else’s Scourge (probably because Jacer was peer-pressuring me to buy other things at TFCon). Sovereign isn’t too far out in first though, as Planet X’s Phobetor (Fall of Cybertron Bombshell) is the most fun I’ve had with a small transformer in quite some time and I highly advise getting the set of bugs for a Generations/Classics display or a WFC/FOC display. So, two years ago I indicated that I was getting tired of the never-ending stream of 3rd party products. Specifically, the Masterpiece “collection fillers” that were ultimately replaced by generally superior official product. 2017 sucked me back in a bit with the now legendary 3P Masterpiece Cosmos wars, as well as my standard fill of IDW MMC figures. Well, this year as best as I can tell I stuck to my guns and ended up with a single figure, MMC’s Collisus (Thunderclash). This inexplicably handsome boy follows up what would have been my 2017 top pick (Kultur) had there not been an onslaught of Cosmoi (Cosmoses?) last year. This mold features nice heft, a fun but simple transformation, and good posability. It’s a really, really good mold no matter which flavor you pick up. I have no runners up other than Nonnef upgrade kits. I also bought some of them. Just look at Lumpy’s list for those. I concur if he says they’re good. Actually, just do whatever Lumpy says. It’ll be easier that way. This is a weird answer because it feels like I’m voting on half of a toy and maybe my anticipation for the release of Inventa is fueling my choice a little. But, Mastermind Creations Magna’s stature and overall size is a presence on my display and I see him out of the corner of my eye every time I walk in my room. It’s like the size of a small house cat. Kudos to Mastermind for also figuring out a fun transformation for a toy that is essentially a block! I cannot wait to finish this set! The shift from CHUG scale to Masterpiece and Legends scale has left me few options to add new 3P figures to my collection. The only full 3P figure I purchased in 2018 was TFC Toys’ TF-03 Wildhunter (TF Victory Blacker). While there are a few nitpicks I have with the figure, overall it is a nice figure and I am happy to have it in my collection. For those of you who are unaware, Wildhunter is TFC Toys’ homage to the leader of the Brainmasters, Blacker, in Japan’s Victory toyline. The figure transforms from a black dune runner to a robot and combines with fellow Trinity Force (Brainmaster) teammates to form TFC Toy’s take on Road Caesar. I think he looks great in robot and combined modes but getting him there is a chore. There are a lot of moving parts—it is not a difficult transformation but it is lengthy. Lots of moving stuff out of the way to move the part you need to move and then moving things back. It’s not very fun. The alt mode is ok and nicely detailed but I feel the car body is a bit thick when looking at it from the ground up and I wish the wheels were larger. The tiny, stubby wheels negatively enhance the thickness of the vehicle mode IMO. The robot mode looks bulky and tough with decent posability. He has lots of ratcheted joints and is able to hold different poses. The figure does a decent job of it but his kibble can get in the way. The Brainmaster gimmick can be tricky to get it to work properly, but of the two faces (one comes with a replaceable head that eliminates the Brainmaster gimmick and gives the figure some head rotation) the one that works with the Brainmaster gimmick looks way better than the “Elvis sneer” that is molded on the replacement head. I wish I could swap the face plates but it is molded onto the helmet. When combined with the other Trinity Force figures he is solid, imposing, and a great homage to Road Caesar and I feel the combined mode is the best mode out of the three. The only real downside is that you have to sort of “untransform” the leg a bit to get any knee bend and I really don’t like the mouths on the Combiner faces (there are two—one neutral and one sort of sneering face). All in all, I give this figure an 89 out of 100. There were a LOT of cool 3P releases this year, but this set found a welcome spot in my MP Decepticon display. I feel like they bridge a scale gap left by the official MP Rumble/Frenzy set. They’re well constructed, beautifully decorated, and the pile driver gimmick is both unique and crazy. My runners up were all awesome figures, but I had to pick the one that had the biggest impact in my display. This was a pretty mild year of 3P purchases for me. While I loved most of what came in, and am proud to display all of them, it came down to playability this time. I usually reserve that for mainline, inexpensive figures. But the price to fun/adorable ratio on this little dude is phenomenal. I’m not sure I’ve fiddled with any figure as much as I have this one. I generally do not pick up much in the way of third party, but I couldn’t refuse this version of Bumblebee. 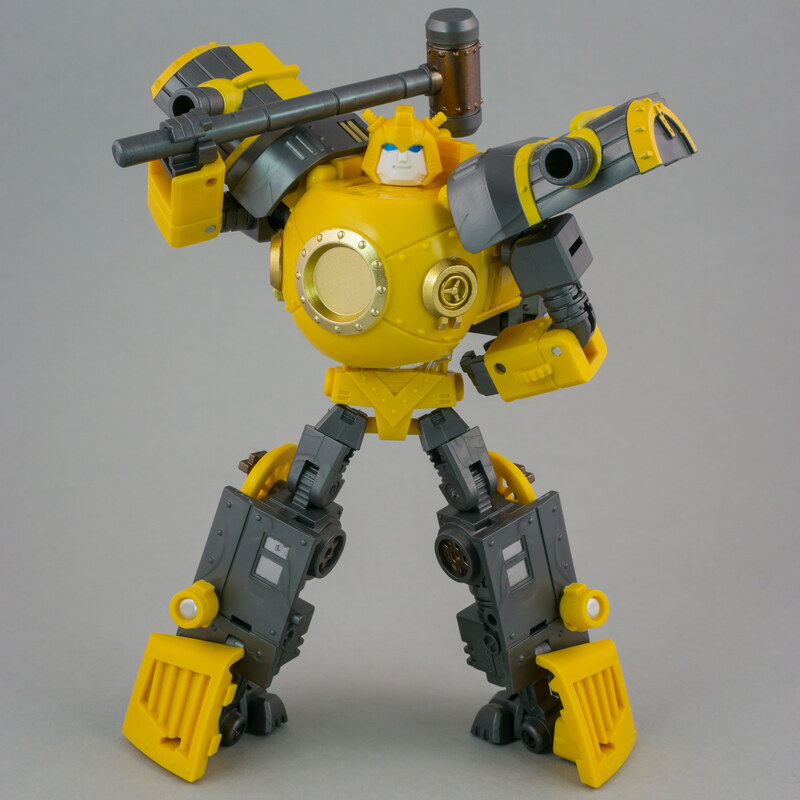 Not only is he a rendition of the Hearts of Steel Bumblebee design – with a nice steam engine alternate mode, something we do not see very often which I greatly appreciate – but he is also a budget release. Unlike some third party releases, this is a solid, quality figure who is more than reasonably priced. As a vintage G1/G2 collector, the G2 Stunticons have always been on my list of figures that are too expensive for my collection. The Stunticons are my favorite combiner group by far, and I’ve been excited for X-Transbot’s offerings of their Stunticons-styled figures for quite a while. Once I got my standard version of Crackup, I was blown away. It’s a figure that just ticked every checkbox for me. Then along came the TFcon version in the G2 colors. I am usually much more classic and traditional in my tastes, but this figure is just simply striking. It has all of the excellence of the initial release of Crackup, but an extra bizarre coolness factor. I went from thinking a set of G2 Masterpiece-style Stunticons was an easy pass to an absolute must have. Crackup (both versions) have resonated with me more than any other 3rd party purchase I’ve made this year, and we’ve had a year of some really great releases. There’s been a long history of attempts to do a G1-centric transforming figure of Arcee, and this is the first one since the official Generations figure to pull off that task to my satisfaction. Stealth Azalea is both the best Arcee figure I’ve ever handled and the best Ocular Max release I’ve ever handled, breaking a long string of releases that often left me looking at Reformatted as a stronger older sibling line. Huge points for having both a full suite of SHF/Figma tier articulation, as well as a solid sculpt that doesn’t loudly throw unwanted callbacks to the character’s nigh 30-year history of shrug-worthy fan-made pin-up posters. But the true clincher is the fact that this is the best G1 Arcee transformation I’ve ever handled. It has flow, it has an intuitive and natural progression, and achieves its goals in both directions without frustration, over-complexity, or machine-brained assemblies of telescoping multi-jointed sticks. I’m not huge into 3rd party purchasing. I love the figures but with such a variety of product from multiple companies, I try to be selective. The stunticons have always been some of my favorite characters and X-Transbots looks to be scratching that itch just the right way. Crackup is a perfect masterpiece addition representing Breakdown. The transformation is simple and clean. Both modes are extremely accurate. And of course, the price cannot be beat. WOO! OH! And don't think you can just charge $75 to offset these fees/costs — the 30 other sellers on eBay will undercut you and make it impossible to sell at $75! And, there are always Chinese sellers who pay far less in shipping costs (due to unfair shipping rates in China), and can therefore profitably charge less than you. Next, don't forget to consider your storage costs, where you held this toy for some 10 years (i.e. you profited 80 cents per year of storing this toy). Finally, aside from storage and space expense, consider the time it takes you to list the item and ship it – you're definitely working for less than minimum wage. (In other words, a realist would tell you to dump the toys in the garbage and work somewhere for a real wage, if your goal was to profit from your collection in a meaningful way). Of course, there are RARE exceptions, where someone can sell a G2 Stunticon toy for $30k – do NOT throw that one in the garbage! When I sell chunks of my collection, I KNOW I'm not earning a profit – I'm simply trying to reclaim as much value as I can, for the amount of work (and time) it takes to sell the items. If you tell anyone that your collection has somehow appreciated… well, I hope you can sell your collection quickly enough for this to stay true. The longer you wait, the worse the fees/costs are, whereas I'm afraid all toys have a cap on how much someone is willing to pay. Which brings in LEGENDS-scaled 3P (and 4P) – I am gonna keep promoting this alternative as the best method of collecting unofficial pieces AND the best way to get the more obscure characters and odd alt modes! The smaller scale means cheaper production costs and lower prices – plus, each figure doesn't need an entire shelf of display because he's so damn big. Re: Legends scale – yea, I've really been digging my legends purchases. There's a good size part of me that wishes I would have gone that route instead of MP scale. Would have saved a lot of space and money. This is interesting…with the increase of price for official product and the competition between 3rd Parties doing the same characters, I'm finding the prices quite appealing for most 3rd Party MP figures. Add in an eBay flash sale and the prices can be great…not to mention getting the characters years sooner, if at all. Two years later — so much for Takara replacing all those 3P MPs with official product. We'll be retired or in the grave before Takara manages to produce MP figures for most of the characters. At least the (very) few they did turned out to be pretty good products. There's definitely an art to taking advantage of third party. Sure, those two figures aren't great examples as they were earlier on and nobody can predict the future, although there was a time you could have made a killing on Quakewave… But if you can discern what version of a character you'd be happy with and not buy it the second it's released, you can do pretty well. If you wait a month or two after a figure is released when the demand has died down a bit and wait for an eBay flash sale, it can result in some pretty healthy savings where you probably wouldn't get killed selling it, if not make a profit. Oh, for sure. If you buy 10 figures, it's very likely going to cost a lot more than 3 do. But if your goal is a specific cast and you can refrain yourself from buying the latest version every time one becomes available…then 3rd Party is looking more and more the way to go. For example, I think a TT Galvatron is incredibly likely at some point. I also think it will cost upwards of 200 and who knows how much longer before it comes to be…where as I got FT Galvatron for $128 shipped and has been on my shelf for at least a year (I don't remember if I got it a year ago or if it's been two already.) While I am pretty sure I will like the look of TT's better, I am more than happy with what I have, I've already had it all this time, and I'll be relieved not to give 2 shits when TT's costs $275 shipped or whatever ridiculous price it ends up being.